Only a couple vehicles have I ever felt like I waisted money on buying extended warranties, both were Land Cruisers. Go figure. 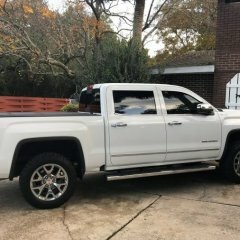 I disabled AFM on my Sierra around 90,000 miles (Diablo inTune i2). I'm at a 149,000 miles now. Oil changes have always been around 7300 miles (follow OLM). Engine consistently burns around 3/4 of a quart between changes. Didn't notice any change in oil consumption after disabling AFM. My reason for disabling AFM was I found it did little for economy. Most of my driving is highway. It would stay in V4 mode if I would keep it under 60 MPH but most of my driving is at 70+. It would kick in/out when at these speeds and I could tell it every time it did. It also seemed to engage too quickly while under light acceleration. I wouldn't be to my desired speed and it would be switching to V4. This combined with excessive torque management/poor throttle response, and the transmissions eagerness to get into 6th gear made stop/go driving someone annoying. The Diablo tune helped alleviate some of this (raised partial throttle shift points, reduced torque management, increased throttle response, disable V4). In 2011 a shield was placed over the oil pressure relief valve in the pan to keep oil from spraying the cylinder walls. I can't imagine that the Gen V engines do not have this feature. In the same year, AFM VLOM and lifters were vastly improved but dirty oil is AFMs greatest enemy. Gen V engines have different AFM arrangement and are much more reliable and because of their extra horsepower, make more use of cylinder deactivation for improved fuel economy. AFM Gen IV engines in a Suburban rarely see V4 mode on level ground because they just don't make enough hp per cylinder to move such a load down the road. Disabling AFM has the potential to extend the life of the lifters but they can still fail, even the standard ones fail. When the lifter guides get old and crack, the lifters rotate and wipe themselves and the cam lobe out. It is also said that this can also cause a De-Ac lifter to collapse. You Gen V, K2 drivers have a lot less to worry about then those driving GMT900s with Gen IV motors equipped with AFM. I’m leaving mine off. I got a 7” lift on 35’s. I rarely saw V4 mode lol. A little common sense will go along way on this one. It takes very little to keep the V4 mode off except going down hill. Bigger tires, a trailer, a little weight in the bed. Mine at highway speeds came on very little anyway, down hill mostly. In town I drove in M5. I turned it off. In pre 14 models the we’re turning them off to stop them from using oil. If anything it extends the life of those very active internals. Great video on AFM and some tips. My Cyl 4 intake lifter deactivated even with V4 mode turned off via Diablo tuner. So it is possible. Thus why I'm just putting in all the extra parts. I changed my oil every 2 months regardless of the miles I put on it. So you are doing the AFM DELETE correct? That's my future plans after warranty is over. Yes. My 2014 has exited the warranty period. Since I had the lifter crash I ordered a bunch of stuff. I don't plan on jumping into a newer style Sierra Denali. So I ordered a complete Heads/Cam/DOD delete package from Texas Speed performance. Putting a Nick Williams 103mm Throttle body, on a LT4 Supercharger and A Circle D pro series stage 3 converter for the cam and power it will put out. I'm also converting to E85! Supposed to help the flow of fuel and give a little extra kick. And obviously tuning the truck. Thanks I would have never thought that. Mine is not real bad unless it's like 10 or colder. Probably just leave it for now but good to know. Exactly, I was thinking more in the line like it was going to be a little motor caused by larger heavier wheels and tires but when the tech told me the cabin lights dimmed when turning steering wheel I knew it was electrical. I then worried while they were going to do a diagnostic they would see it was tuned even though I switched back to stock before getting there. It’s all good now, glad i could help, maybe pass that photo around for stiff steering when cold.